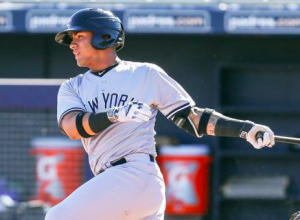 Perhaps no prospect in baseball has received more attention over the past six months than shortstop Gleyber Torres. Of course, being traded to the New York Yankees for Aroldis Chapman will do that. On top of that, Torres was also named MVP of the Arizona Fall League despite being the youngest player in the league. The trade to the Yankees and his performance in Arizona have helped to raise Torres’ profile considerably, and now the Yankees are trying to plan out the next few years of his career so that he’s in a position to help them return to prominence. Cashman doesn’t think Torres will reach the Bronx in 2017, but if all goes well for him, he could make his big league debut at some point in 2018. The presence of Torres already has the Yankees thinking about what to do with current shortstop Didi Gregorious, who is under team control for two more years before becoming a free agent. Second baseman Starlin Castro is also under contract for at least three more years. What the Yankees will do if Torres and Mateo force their way to the big leagues while Gregorious and Castro are still under contract remains to be seen, but the team has already thought about it, and they appear to have plenty of options. If Torres and/or Mateo get to the majors sooner than expected, the Yankees will find a way to manage, and they’ll be just fine with whatever they choose to do.